Outside the U.S., the sport where two teams try to kick a ball into the other side's goal without using their hands is known as “football.” However, when it comes to the tabletop version of the game, it seems impossible to reach a consensus. 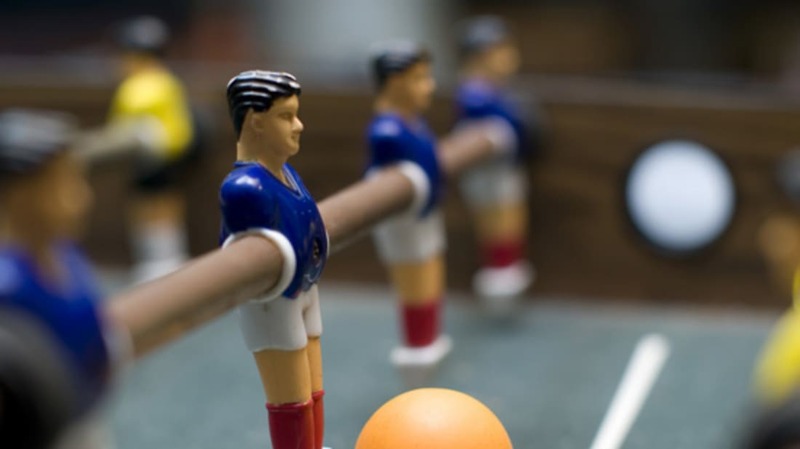 In the UK, the game is “table football.” In France, it’s adorably called “baby foot.” In much of Eastern Europe, it’s “kicker,” after one of the first companies to produce game tables. And in Spain, it’s "futbolín." As usual, Americans have to be different, so we’ve borrowed the German word for “football”, “fußball”, which is pronounced “foosball.” But because the game is played all over the world, there are dozens of regional nicknames for this very popular pastime. Some sources believe that it started as a parlor game in the 1880s or 1890s, possibly in different parts of Europe simultaneously. Nobody is sure who invented it. Frenchman Lucien Rosengart, an automobile engineer for Citroen, claimed to have come up with the game to keep his grandchildren entertained in the winter. But Alexandre de Fiesterra also said he had the idea while in the hospital recovering from injuries sustained in the Spanish Civil War. The only thing we can say for sure is that Englishman Harold Searles Thornton has the earliest-known patent from 1923, which looks and operates just like the game we know today. Smaller manufacturers were able to keep the tournament going until 2003, when the Championships moved to Europe and are now regulated by the International Table Soccer Federation. Although the game isn't as popular as it once was, there are still plenty of high-profile tournaments across the country with thousands of dollars in prize money to be had. If you're in the market for a foosball table, you can pick up a good quality model starting at around $500. But if you have a little money to spare, there are more impressive examples to be found. The Teckell Collection from B.Lab features eight different models all made with crystal glass sides and playing surface. Available options include walnut accents, aluminum hardware, or even gold-plated handles, all hand-crafted for precision and beauty. A small, coffee table model starts around $7,500, while the stand-up models start at $10,000 and go up from there. How far? Far enough I couldn't find a price for most models. Mars Made has two custom foosball tables available. The powder-coated steel side panels and solid aluminum body of the Foos I gives you more of an industrial feel, while the retro TV-inspired design of the Foos II features an aluminum case with carbon fiber playing surface. In 2008, Audi Design developed an aluminum foosball table. Originally produced only as a one-off promotional item, customer demand convinced the company to produce 20 of them in 2010 for high-rolling fans. French designer Chloe Ruchon has done the impossible – combining the machismo of sports with the pretty pretty princess pink of the infamous Barbie doll. This 2009 design, featuring 22 armless Barbie dolls, was sold exclusively at FAO Schwarz, and can count Charlie Sheen as one of the proud owners. The Lux Gold uses only the highest-quality materials, like stainless steel and unbreakable glass to create a beautiful yet durable table that will last generations. Choose between 50 different colors for the table's accents, and from 12 different styles and materials for the men, to give your game room a unique centerpiece. Design company Eleven Forty has come up with a foosball table that can truly be called your own. Made with etched glass, stainless steel, and a highly polished wood casing, perhaps the most impressive feature are the figures. Eleven Forty can scan in photographs of your friends and family and cast detailed recreations onto the players. If you don't want to get that personal, you can also create a Good vs. Evil table, featuring famous, unlikely players like Jack the Ripper, Gandhi, President Obama, Idi Amin, and more. Inspired by modern football stadiums, The Beautiful Game, from 11, a design house in the Netherlands, is the crème de la crème of foosball tables. The table features chromed metal players, lights embedded in the playing field to display the current score and goal areas, and requires 12 weeks to build by hand. The Beautiful Game table will definitely make an impression – even if your foosball skills won't.